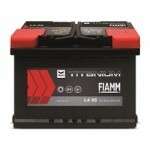 The TITANIUM Black category is the result of FIAMM technology and expertise, that results of OEM original equipment. It is a high quality product with a strong Italian personality. Now FIAMM is a world wide leader for high quality starter batteries made for the OEM original equipement of the most prestigious car suppliers : Opel–Vauxhall, Mercedes Benz, Peugeot-Citroën, Renault, Ferrari, Maserati, FCA Group, Volvo, Jaguar, Toyota şi Nissan. FIAMM has a wide experience in the field electric transportation (FCA Brazilia and the awarded IVECO Daily Electric) and the public transportation, having major collaborations in USA, United Arab Emirates, Australia and Europe. Acumulator auto 12V 60Ah 510A TITANIUM BLACK INV L2X 60. Pentru autoturisme cu motoare pe benzina cu cilindreea de maxim 2000 cm3 si motoare diesel cu cilindreea de maxim 1600 cm3.